Part of the Ayres Art Deco style lighting range finished in polished chrome with feature glass dishes. Square polished chrome ceiling mount and chunky tapered drop rod supporting four slightly curved arms, each holding a square striped frosted glass dish shade. A lovely compact feature ceiling light that would be ideal in any Art Deco themed home. This light fitting is 512mm high. Please ensure that you have the necessary ceiling height. Hello Michelle and thank you for the question. This Ayres Art Deco style ceiling light is not suitable for use in a bathroom as it is not IP rated. A selection of suitable fittings can be found by following this link. Further information on bathroom IP ratings can be found at the bottom of this page. Is the height (easily) adjustable? 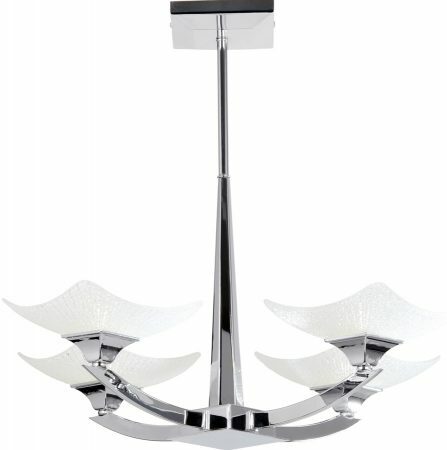 The Ayres Art Deco Style 4 lamp ceiling light is not height adjustable. It is fixed with a 515mm drop.